Well then. This is my home page, once again. Technically, this is "version 4.0," I think. Unless you count the very original one, which I've long lost, but it's similar to what I'm now calling version 1.0. In any case, this is the "new" version of my home page, provided that you're viewing it before some time in the future, when I make the next version. If you're new here, you may be wondering what on earth the raindrop-like creature with a huge grin on his face is doing at the top of my page. That is a slime. Yes, a slime. He's just a little creature I use whenever I need some sort of character or something. 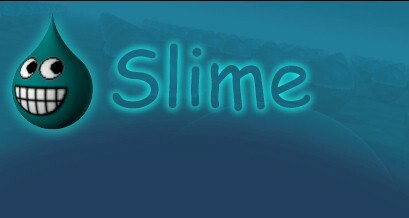 Specifically, his name is Slime (creative, huh?) and he has a girlfriend named Katy. Actually, her name might be Kate... I can't remember any more. Regardless, there's a whole long story line about this guy, but I won't bore you with that right now. In fact, I probably won't bore you with that ever. We'll see. As you look around my site, you might notice that not every page has the same layout. I'd just like to say that this has been done more or less on purpose. I don't want to confine my creativity by making all my pages look the same; my goal here is to have fun, not to create an easily navigatable site. Besides, it can be fun to get lost in a site. =) Of course, there are areas that *do* look similar (such as this page and some of the ones it links to). One last thing. When I say =) or =D, it does not mean that the previous statement is equivalent to a parenthesi or the letter D. (Oh, and according to Microsoft Word, I did spell the word "parenthesi" correctly, which I'm somewhat proud of.) Those things are emoticons, or, more simply put, smileys. Tilt your head ninety degrees to the left and look at them.